At today's media event that saw the debut of new iPads and a new Retina iMac, Apple announced that its Apple Pay mobile payments solution will launch on Monday, October 20 alongside iOS 8.1, which will enable the service. According to Apple, more than 500 additional banks have signed on to support Apple Pay, as have dozens of additional retailers. In store payments with Apple Pay will require the iPhone 6 or iPhone 6 Plus, as they both include NFC chips, and the Apple Watch will also be able to be used to make in-store payments when it launches. The iPhone 6, the iPhone 6 Plus, the iPhone 5s, and the newly released iPad Air 2 and iPad mini 3 can make online purchases with Apple Pay in apps that support it. Apple places a heavy emphasis on security with Apple Pay, and the company's Apple Pay press release once again points out that Apple Pay does not store actual card numbers, replacing them instead with a Device Account Number in the Secure Element, pairing them with a one-time use code that verifies each payment along with Touch ID. Apple Pay protects personal information by preventing stores from seeing a user's credit card number, name, and more. It also does not collect transaction information, keeping transactions between the user, the merchant, and the user's bank. Credit cards and debit cards from the three major payment networks, American Express, MasterCard, and Visa, are supported by Apple Pay, and several banks, including Wells Fargo, Bank of America, Capital One, and more have signed up to partner with Apple on the payments initiative. Apple Pay will be accepted at any retail location that can take contactless payments, and in addition, Apple has signed up with specific retailers like Whole Foods, Macy's, Sephora, Staples, and more, to ensure Apple Pay will be accepted in those stores. A number of retailers have also signed up to accept Apple Pay payments within their apps, including Target, Uber, Panera Bread, Lyft, and more. 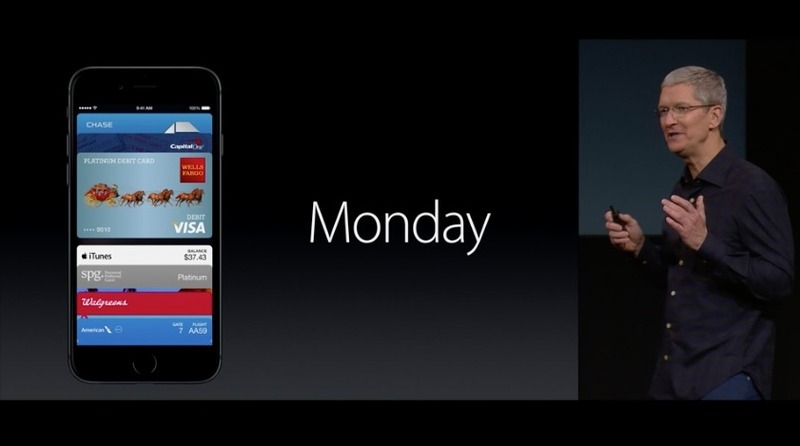 Apple Pay will be available in the United States beginning on Monday, October 20, following the release of iOS 8.1. Apple suggests that prospective Apple Pay users contact their banks to determine their card's Apple Pay eligibility, as some banks may not support all card types. Apple was smart and went with the evolution of an evolving and decided industry initiative (one use codes per transaction) that VISA and AMEX (IIRC) both agreed on last year. Google tried to make credit cards as they knew them 'cool' and 'high tech' rather than tackling the existing problematic dynamic WITH the credit card companies. I can't wait to pay for a gatorade at the gas station mid-way through my run with just my phone. But some members don't trust Apple Pay yet. so this keynote is a comedy show or what? i like it! Instead of being honest Apple decides to bring 8.1 as the next big thing yet the adoption rate is lower then that of ios 7 and there are tons of people pissend off how buggy it is. Nothing is unhackable. Don't be fooled. Oooh! A keynote thread with hardly any posts! All the others have 200 posts already. What to add.. what to add.... Did you hear about Ohio closing schools because Frontier Airlines landed in Dallas? One point I've wondered about. If someone gets your card info (either through skimming or some other act) they could conceivably put the info into their iPhone and start using it. I wonder if this issue will eventually be used to push liability back to the account holder. Apple Pay sounds pretty good. So good for Apple that I bought another 200 shares of APPL today. And it just might be the thing that pushes me to buy an iPhone next time. Guess I have time to wait and see how it all works. And then every fraudulent transaction would easily be traced back to that phone. That would be a very dumb criminal and they would be easily caught. I don't think that's really the point. It's a good update, but suggesting that something is unhackable is pretty laughable.